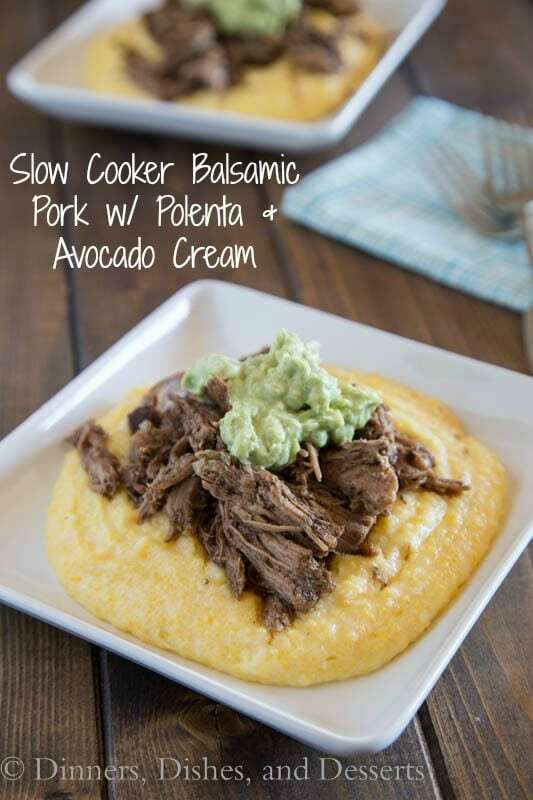 Slow Cooker Balsamic Pork – Creamy polenta topped with slow cooker balsamic pork and a creamy avocado cream. 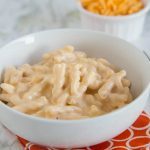 Super easy comfort food! 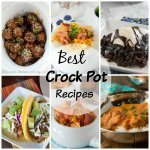 Lately I am kind of obsessed with my crock pot. There are so many great things you can make in it. 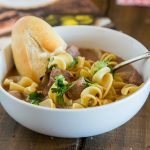 This slow cooker balsamic pork is a staple all fall and winter long at our house. Seriously so good, and can be eaten in so many different ways. 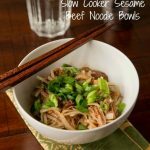 Slow Cooker Honey Sesame Chicken is another favorite. But that should come as no surprise, because Asian flavors are always a hit around here. Chicken Lo Mein anyone? 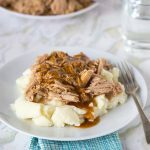 I have to say this slow cooker balsamic pork is kind of just pure comfort food. 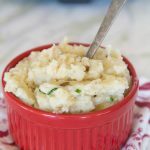 I served it over my favorite creamy polenta, so it is hearty and delicious. Plus, I am a sucker for anything with avocado, so adding avocado cream on top just brings it all together. 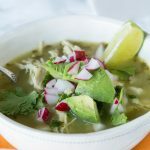 Don’t be afraid of totally mixing up dinner with your crock pot. 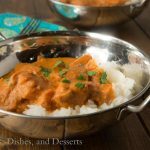 Tikka Masala in the crock pot is darn amazing. 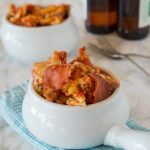 Serve it up with some rice or naan bread and you have another comfort food dinner you can have waiting for you at the end of the day. 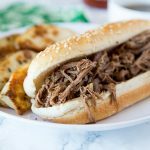 Or French Dip Sandwiches are one of my favorites to make too – then you have tons of leftovers for the week; my kind of dinner. The first time I made this balsamic pork, we had friends over. It was a huge hit, we hardly had any leftovers. Considering there was just 5 of us, that says a lot. My son wasn’t a big fan of the polenta part of it, but he ate crazy amounts of the pork. The second time I made it we used the leftovers as a pulled pork sandwich, and that was wonderful too. And we have been making for years since! 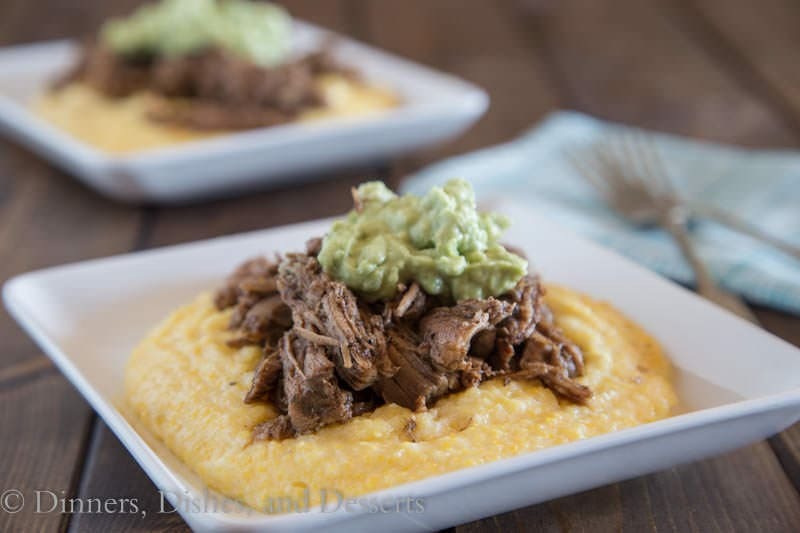 Creamy polenta topped with slow cooker balsamic pork and a creamy avocado cream. Combine all of the ingredients for the Balsamic Pork (minus the pork shoulder). Mix until well combined. Place pork in the slow cooker. Pour balsamic mixture over the top. Cover and cook on low for 6-7 hours. Using 2 forks, shred pork. Add back to the liquid and keep warm. To cook the polenta heat milk and chicken broth in a saucepan. Whisk in polenta and salt. Cook, whisking frequently, for about 10-15 minutes or until thickened. Mix in cream cheese until well combined. Meanwhile mash avocado and mix with sour cream, salt and pepper. To serve scoop polenta into the bottom of a bowl. 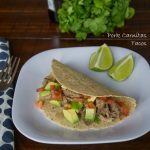 Top with shredded pork and a dollop of avocado cream. We’re not big on celebrating St Paddy’s Day either so tonight will be pretty normal for us, too! 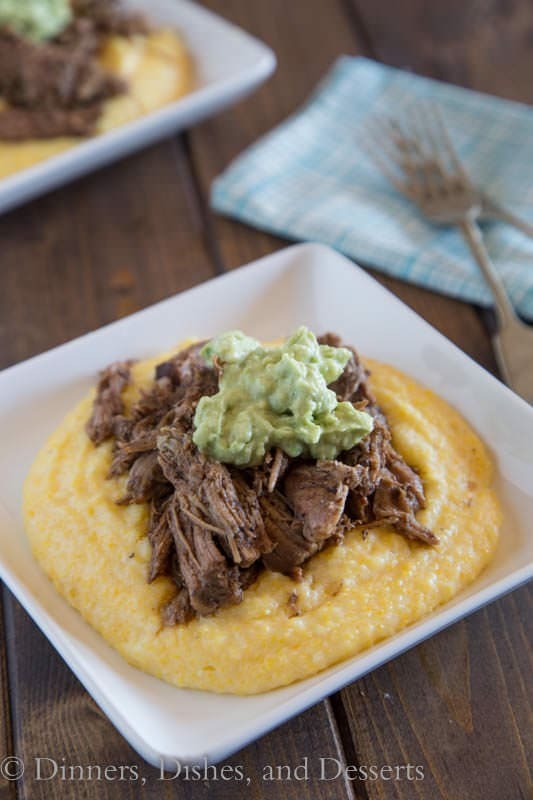 This pork looks delicious…and I love how you put it over polenta! This looks amazing. 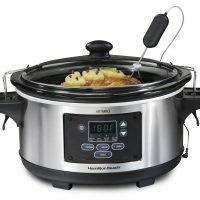 I’m always looking for more recipes for my slow cooker. What a fabulous dinner this made! 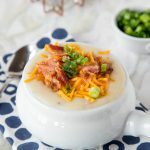 My family raved about this and my teens are eager for leftovers tonight! Thank you! That is great Karen! Thank you so much for coming to let me know. glad you enjoyed it. Hi there! I made this for dinner tonight, and it took me FOREVER to boil down the polenta mixture, and when it was a good consistency I really didn’t have very much polenta (definitely not enough to feed 5 people, as you did!). I’m wondering if the measurements are right – should it really be 2 cups milk and 1 cup polenta, or maybe 2 cups polenta and 1 cup milk? The other thing that made me wonder was that mine turned out much less yellow than yours is. Melody – I just follow the direction on the bag of polenta when I make it. I just googled it, and it is at least 2 cups of liquid to 1 cup of polenta. You can use more liquid if you want it creamier. The color will depend on the brand you buy. I use Bob’s Red Mill Yellow Polenta. They also sell instant polenta, so check the directions on the package you bought.